Heathens and Pagans of a Germanic bent are fairly familiar with goddesses such as Frigga, Freya, Idunna, Sif, Skadhi, Sigyn, Hela, and the three Norns, who weave the Wyrd of their followers. However, the distaff half of the Norse/Germanic pantheons did not end there; there were strictly Germanic goddesses like Nerthus, lesser-known goddesses such as Var, the Goddess of Oaths, and the handmaidens of Frigga. Even less well known than those, however, are Eostre — known (when She is known at all) only for the Spring holy day that bears Her name — and Hreda, whom I had never heard of before; some heathens consider Her a goddess of speed. Shaw’s book dissects what knowledge we have about these two goddesses — and the Cult of Matrons — with tools from many fields — archaeology and history, of course, but mostly linguistics, etymology, and linguistic history. The real meat of the book starts in chapter 4, where Shaw digs into what we know (and don’t know) about Eostre, the better-known of the two goddesses discussed in this book; accounts of both of these goddesses are drawn from the works of the Christian monk known as the Venerable Bede, whose work Historia ecclesiastica gentis Anglorum (or The Ecclesiastical History of the English People), is one of the earliest original records of British history. Shaw points out that, according to Bede, the month of April was named after Eostre. Shaw’s main thrust, then, is to try to discern whether worship of the goddess Eostre, in April (the month of Easter/Ostara) was pan-Germanic or limited to specific portions of the countries inhabited by Germanic tribes. He works to refute Jacob Grimm’s claim (in Teutonic Mythology) that Eostre is simply a goddess of the dawn and its light. Shaw points out that proof for the goddess’ worship in ancient times can be verified by numerous place-name inscriptions containing etymological links to Eostre’s name. In chapter 5, Shaw works to similarly prove or disprove the existence of the worship in ancient times of the goddess known as Hreda (or Hreða). Like Eostre, references to Hreda are found first in the work of Bede, with all later references taking their cues from the monastic historian. Such references mention only that Her name is found in connection with the name of the month of March, or “Hredmonath”. Shaw considers etymological connections of Her name to the Old English words “reed”, “goatskin”, “fierce”, “to rejoice”, “victory/glory”, and “quick”, and finds some more likely than others, but — as with Eostre — finds more evidence of the goddess’ name associated with place-names than any deific function. 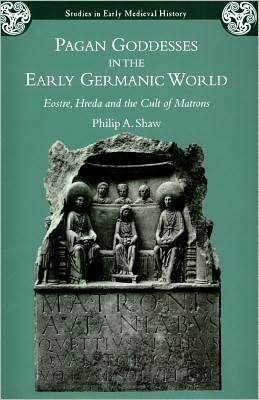 Shaw’s work here is a vital, if not precisely essential, piece of the historical puzzle regarding pre-Christian worship in Anglo-Saxon and other Germanic areas. Very little academic work on these two lesser-known deities has previously been attempted, and Shaw demonstrates an elegant panache for dismissing flimsy arguments built on half-understood linguistic cues and scant archaeological evidence (a handful of place-name inscriptions, many not understood or discovered before 1958, and so missed by researchers before that time). The work reads fairly easily for an academic work, and is heavily footnoted, with sources provided and a full index at the back of the book. For those heathens and Germanic pagans interested in historical veracity over romantic imaginings, this book will prove a vital addition to their library.